The Competition this year was held at two levels- Regional and National. The Regional rounds for the Competition were successfully completed in Mumbai & Delhi on 23rd February, 2018. Ashok Leyland emerged as the Champions, Titan Company Ltd as I Runner-up and Tata Power Compnay as II Runners-up in the Private Sector Category. Hindustan Aeronautics Ltd emerged as the Champions, Gujarat State Fertlizers and Chemicals Ltd as I Runner-up and Hindustan Petroleum Corporation Ltd as II Runner-up in the PSU Category. The event was supported by Patton Ltd, K J Somaiya and Rukmani Devi as sponsors. 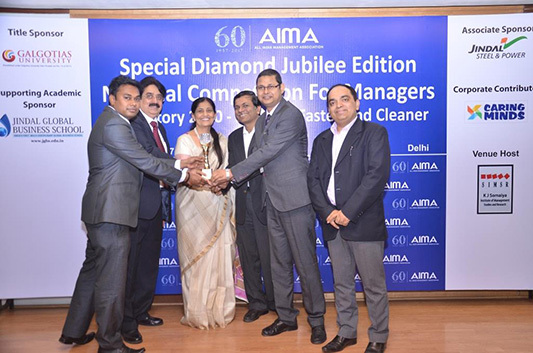 AIMA is celebrating its Diamond Jubilee this year. To commemorate the same AIMA launched the 1st National Competition for Managers 2017, a presentation competition. Teams from PSU and private sector participated enthusiastically. The theme for the event was ‘India Story 2020 : Smarter, Faster and Cleaner’. The event was held at 2 regional locations i.e. Delhi and Mumbai, followed by a Grand Finale in Delhi. The presentations were evaluated by very senior people from the corporate and academic world in both the regionals rounds and the Grand Finale. The winners were chosen in general and PSU category in both the regionals and Grand Finale. The Grand finale was held on 11th March, 2017 in Delhi. YES BANK emerged as the winner in general category. SAIL and BPCL were joint winners in PSU Category. NPCI and BHEL were given special jury mention for their excellent presentaions. The event was supported by Galgotias University, Jindal Steel and Power, Jindal Global Business School, Caring Minds and KJ Somaiya Institute Of Management Studies and Research as sponsors. Mr. Ayush Gupta – DGM, GAIL.